Research makes all the difference, and we are doing it right. Astym® treatment is the only therapy approach that was produced through rigorous scientific development: from theory through basic science investigation to clinical study and practice. Theories regarding mechanisms of action for Astym® treatment were developed based on the foundation of recent histologic research identifying the primarily degenerative nature of tendinopathies, and the investigations into the use of cellular mediators, growth factors and related products to assist in the healing and regeneration of tissues. Guided by these principles and proposed theories, the Astym® process research team conducted their own basic science and clinical research to develop and refine non-invasive protocols aimed at activating a regenerative process. Once the Astym® protocols and process were optimized, clinical studies and trials confirmed Astym® treatment’s effectiveness. At its core, Astym® treatment was developed from basic science investigations to stimulate regeneration at a cellular level and eliminate or reduce problematic scar tissue that may be causing pain or movement restrictions. Astym® treatment consistently shows its effectiveness in resolving soft-tissue injury. Not only does it demonstrate great success as a first-choice treatment, it routinely demonstrates success after other treatments have failed. In addition to the published, peer-reviewed scientific and clinical research on Astym® treatment, perhaps one of the largest case series ever conducted is contained in the independent database, the Astym Analyst™. Clinicians from all across the country independently enter data to create a national bank of outcomes data on Astym® treatment, which shows the actual response rates for each diagnosis, patient type, co-morbidities, etc. Not only does this provide a good real-world evidence base for Astym® treatment, it also gives patients and health care providers valuable benchmark data, so they know how many treatments it should take to resolve a certain condition. Astym® treatment is a unique therapy process, and that is why research is done specifically on Astym® treatment rather than on a generic category. All of the articles below relate to Astym® treatment and its specific protocols. Chughtai M, Newman JM, Sultan AA, Samuel LT, Rabin J, Khlopas A, Bhave A, Mont MA. Astym®therapy: A Systematic Review. Ann Transl Med. 2018 doi:10.21037/atm.2018.11.49 To download a PDF of the full text of this study, click here. Sevier TL, Stegink-Jansen CW. (2015) Astym treatment vs. eccentric exercise for lateral elbow tendinopathy: a randomized controlled clinical trial. PeerJ 3:e967; DOI 10.7717/peerj.967 To download a PDF of the full text of this large, controlled clinical trial, click here. Kalson NS, Borthwick LA, Mann DA, Deehan DJ, Lewis P, Mann C, Mont MA, Morgan-Jones R, Oussedik S, Williams FM, Toms A, Argenson JN, Bellemans J, Bhave A, Furnes O, Gollwitzer H, Haddad FS, Hofmann S, & Krenn V. (2016) International consensus on the definition and classification of fibrosis of the knee joint. Bone Joint J, 98-B(11),1479-1488. Accessed December 14, 2016. To view the abstract of this study, click here. McGinn T, Chughtai M, Bhave A, Ali O, Mudaliar P, Khlopas A, Harwin SF, Mont MA. Innovative Multi-Modal Physical Therapy Reduces Incidence of Manipulation Under Anesthesia (MUA) in Non-Obese Primary Total Knee Arthroplasty. Surg Technol Int. 2016 Sep 10;XXIX. pii: sti29/764. To view the abstract of this study, click here. Bhave A, Corcoran J, Cherian JJ, Mont, MA. Astym Therapy for the Management of Recalcitrant Knee Joint Stiffness after Total Knee Arthroplasty. J Long Term Eff Med Implants. 2016 vol. 26(2) pp. 151-159. To view the abstract of this study, click here. Chughtai M, McGinn T, Bhave A, Khan S, Vashist M, Khlopas A, Mont MA. 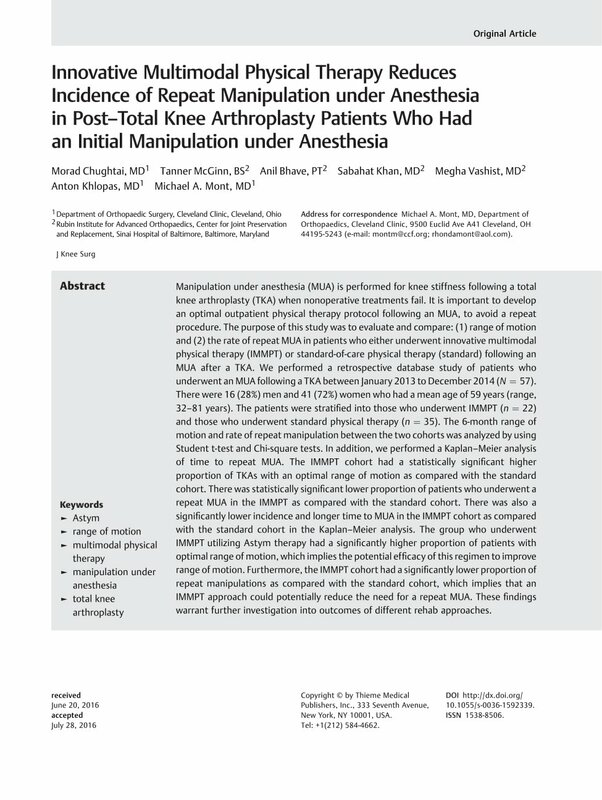 Innovative Multimodal Physical Therapy Reduces Incidence of Repeat Manipulation under Anesthesia in Post-Total Knee Arthroplasty Patients Who Had an Initial Manipulation under Anesthesia. J Knee Surg. 2016 Sep 21. To view the abstract of this study, click here. Bhave A, Shabtai L, Woelber E, Apelyan A, Dror P, & Herzenberg JE. (2016) Muscle strength and knee range of motion after femoral lengthening. Acta Orthopaedica. DOI: 10.1080/17453674.2016.1262678. To download a PDF of a full text of this study, click here. Scheer NA, Alstat LR, Van Zant RS. Astym Therapy Improves Bilateral Hamstring Flexibility and Achilles Tendinopathy in a Child with Cerebral Palsy: A Retrospective Case Report. Clinical Medicine Insights: Case Reports 2016:9 95-98 doi:10.4137/CCRep.S40623. To download a PDF of the full text of this study, click here. Miller MM, Ray JM, Van Zant RS. The Effects of Astym Therapy® on a Child With Spastic Diplegic Cerebral Palsy. Clin Med Insights Case Rep. 2017 Dec 13;10:1179547617746992. doi: 10.1177/1179547617746992. eCollection 2017. To download a PDF of the full text of this study, click here. Kivlan BR, Carcia CR, Clemente FR, Phelps AL, Martin RL. The effect of Astym® Therapy on muscle strength: a blinded, randomized, clinically controlled trial. BMC Musculoskeletal Disorders 2015;16(1):325. To download a PDF of the full text of this large, controlled clinical trial, click here. Chughtai M, Mont MA, Cherian C, Cherian JJ, Elmallah RDK, Naziri Q, Harwin, SF, Bhave A. A Novel, Nonoperative Treatment Demonstrates Success for Stiff Total Knee Arthroplasty after Failure of Conventional Therapy. J Knee Surg; 2015 Dec 29. [Epub ahead of print] DOI 10.1055/s-0035-1569482. To view the abstract of this study, click here. Davies CC, Brockopp D, Moe K. Astym therapy improves function and range of motion following mastectomy. Breast cancer: Targets and Therapy 2016:8 39–4. To download a PDF of the full text of this study, click here. McCormack JR, Underwood FB, Slaven EJ, Cappaert TA. Eccentric Exercise Versus Eccentric Exercise and Soft Tissue Treatment (Astym) in the Management of Insertional Achilles Tendinopathy: A Randomized Controlled Trial. Sports Health. 2016 Feb 18. pii: 1941738116631498. [Epub ahead of print] PMID: 26893309. To download a PDF of the full text of this study, click here. Slaven, EJ. The role of Astym® treatment in the management of lateral epicondylosis: A single case research design. Orthopaedic Physical Therapy Practice 2014; 26(1): 44-48. Tyler A, Slaven E. The Role of the Astym® Process in the Management of Osteoarthritis of the Knee: A Single-Subject Research Design. Journal of Student Physical Therapy Research. 2013;6(2):1-10. McCormack JR. The management of mid-portion Achilles tendinopathy with Astym® treatment and eccentric exercise: a case report. The International Journal of Sports Physical Therapy. 2012; 7(6):672-677. McCormack JR. The management of bilateral high hamstring tendinopathy with Astym® treatment and eccentric exercise: a case report. Journal of Manual and Manipulative Therapy. 2012; 20(3):142-146. Slaven EJ, Mathers J. Management of chronic ankle pain using joint mobilization and Astym® treatment: a case report. Journal of Manual and Manipulative Therapy. 2011;19(2):108-112. Davies CC, Brockopp DY. Use of Astym® Treatment on Scar Tissue Following Surgical Treatment for Breast Cancer: A Pilot Study. Rehabilitation Oncology. 2010;28(3):3-12. McCrea EC, George SZ. Outcomes following Astym therapy for patients with knee pain: A case series. Orthopaedic Physical Therapy Practice. 2010;22(2):69-74. Wilson JK, Sevier TL. A review of treatment for carpal tunnel syndrome. Disability and Rehabilitation. 2003; 25(3): 113-119. Kipp D, Wilson JK. Carpal tunnel syndrome: A critical review. Critical Reviews in Physical and Rehabilitation Medicine. 2001; 13(1): 67-77. Wilson JK, Sevier TL, Helfst RH, Honing EW, Thomann AL. Comparison of rehabilitation methods in the treatment of patellar tendinitis. Journal of Sports Rehabilitation. 2000; 9(4): 304-314. Fowler S, Wilson JK, Sevier TL. Innovative approach for the treatment of cumulative trauma disorders. WORK: A Journal of Prevention, Assessment, and Rehabilitation. 2000; 15(1): 9-14. Sevier TL, Helfst RH, Stover SA, Wilson JK. Tendinitis: A critical review. Critical Reviews in Physical and Rehabilitation Medicine. 2000; 12: 119-130. Wilson JK, Sevier TL. Methods utilized in treating lateral epicondylitis. Physical Therapy Reviews. 2000; 5: 117-124. Sevier TL, Helfst RH, Stover SA, Wilson JK. Clinical trends on tendinitis. WORK: A Journal of Prevention, Assessment, and Rehabilitation. 2000; 14(2): 123-126. Henry P, Panwitz B, Wilson JK. Rehabilitation of a post-surgical patella fracture: A case study. Physiotherapy. 2000; 86(3): 139-142. Sevier TL, Wilson JK. Treating lateral epicondylitis. Sports Medicine. 1999; 28(5): 375-380. Haller KH, Helfst RH, Wilson JK, Sevier TL. Treatment of chronic elbow pain. Physical Therapy Case Reports. 1999; 2(5): 195-200. Gehlsen GM, Ganion LR, Helfst RH. Fibroblast responses to variation in soft tissue mobilization pressure. Medicine and Science in Sports and Exercise. 1999; 31(4): 531-535. Baker D, Wilson JK. Bilateral carpal tunnel syndrome in a piano teacher. Physical Therapy Case Reports. 1999; 2(2): 73-76. Davidson CJ, Ganion L, Gehlsen GM, Verhoestra B, Roepke JE, Sevier TL. Rat tendon morphologic and functional changes resulting from soft tissue mobilization. Medicine and Science in Sports and Exercise. 1997; 29(3): 313-319. McUsic T. Earn CRED. Today in PT. March 2013: 12-14. Huijbregts PA. Manual Therapy. In: Lennard TA, Walkowski S, Singla AK, Vivian DG, eds. Pain Procedures in Clinical Practice, 3rd ed.Philadelphia: Elsevier Saunders, 2011; 578. Hansson M. Astym treatment proves more effective than home exercise for lateral epicondylitis. Orthopedics Today. 2005; 25(11): 69. Anderson RJ. Pitching in stitches. Training & Conditioning. 2005; 15(3): 15-23. Bassett J, Nickenig T, Olsen D. Top 5 injuries. Advanced for Directors in Rehabilitation. 2005; 14(5): 37-46. Boughton B. Wristoration: Alleviating the pain of carpal tunnel syndrome. BioMechanics. 2004; 11(1): 20-27. Fedorczyk JA. Therapist’s management of elbow tendinitis. In: Mackin EJ, Callahan AD, Skirven TM, Schneider LH, Osterman AL, Hunter JM, eds. Rehabilitation of the Hand and Upper Extremity. St. Louis: Mosby: 2002; 1271-1281. Kleinkort JA. Pain management special interest group: President’s message. Orthopaedic Physical Therapy Practice. 2002; 14(4): 44. Kleinkort JA. A new approach to chronic pain. Orthopaedic Physical Therapy Practice. 2000; 12(1): 44-46. Thomann A, Sevier TL, Wilson JK. Treating soft tissue fibrosis: A new rehabilitation technique for the treatment of various soft tissue injuries. Physical Therapy Products. 1999; 10(5): 56-58. Stover SA. Know your enemy. Not all cases of cumulative trauma disorders are alike. Safety + Health. 1999; 159(6): 86-87. Stover SA. Suggestions for slaying the two-headed CTD beast. Occupational Medicine Clinical Care Update. 1998; 5(10). O’Connor SM. New soft tissue mobilization process claims success in decreasing scar tissue and repetitive motion symptoms. Work Injury Management News and Digest. 1998; 7(1): 3-5. Sevier TL, Wilson JK, Stover SA, Helfst RH. Therapeutic tools in CTS rehab. CTDNews. 1997; 6(10): 11. Freeman S. Tennis (Elbow) Anyone? HB Magazine. Fall 2007; 38. Erickson J. What is Astym? Sweat Magazine. Sept 2007; 22. Hasenbauer B. Staying in the game. Competitor Texas. 2007; 4(4): 35-40. Hays K. Here’s the rub. TrailRunner. 2006; 42: 22-23. Sevier TL. Making Your Practice Thrive in Today’s Market. Impact Magazine. August 2005. Howard GM, Radloff M, Sevier TL. Epilepsy and sports participation. Current Sports Medicine Reports. 2004; 3(1): 9-15. Holmes FC, Hunt JJ, Sevier TL. Renal injury in sport. Current Sports Medicine Reports. 2003; 2: 103-109. Sevier TL, Wilson JK, Helfst RH. The industrial athlete? WORK: A Journal of Prevention, Assessment, and Rehabilitation. 2000; 15(3): 203-207. Roush MB , Sevier TL, Wilson JK, Jenkinson DM, Helfst BH, Gehlsen GM, Bassey AL. Anterior knee pain: A clinical comparison of rehabilitation. Clinical Journal of Sports Medicine. 2000; 10(1): 22-28. Sevier TL. Industrial athlete? Occupational and Environmental Medicine. 2000; 57(4): 285. Fowler S. Responding to managed care. Occupational Health and Safety. 1999; 68(10): 212-215. Thomann A. Entering the world of outcome collection. OT Practice. 1999; 4(8): 45-47. Helfst RH. Why thirst hurts. Safety and Health. 1999; 160(2): 58-59. Pearson D, Gehlsen GM, Wilson JK, Lee G, Sevier TL. An objective measure of lateral epicondylitis. Isokinetic and Exercise Science. 1998; 7: 27-31. Sevier TL. Using sports medicine to treat industrial athletes. Occupational Medicine Clinical Care Update. 1998; 5(7). Sevier TL, Roush MB. Infections in athletes. Spiral Manual of Sports Medicine , Chapter 9. Safran M, Van Camp S and McKeag D. ed, 1998 ; 201-215. Erickson SM, Sevier TL. Osteoporosis in active women - prevention, diagnosis and treatment. Physician and Sports Medicine. 1997; 25(11). Weidner TG, Sevier TL . Sports, exercise and the common cold. Journal of Athletic Training. 1996; 31(2): 154-159. Jones JW, Davidson CJ, Sevier TL. Managing sports-related overuse injuries. Patient Care. April 1996; 30(7): 55-71. Sevier TL. Common infectious diseases in the competitive athlete. Sports Medicine and Arthroscopic Review. 1995; 3(2). 107-121. Sevier TL. Infectious disease in athletes. Medical Clinics of North America, The Office Practice of Sports Medicine. McKeag D ed, March 1994; 78(2): 389-412. Sevier TL, Jones JW. Optimizing training and conditioning, Chapter 18. Current Reviews in Sports Medicine. Johnson R and Lombardo J ed, March 1994; 248-265. Sevier TL. Eating disorders in the athletic population. Sports Medicine Forum. 1991; 8(5): 2-3.